There’s a lot to look at in this card. I like to begin with the number. The number on this card is a 5. When we look at a “5”, we see a small, thin stick; a big, round belly; and a cap over the top. The skinny stick, to me, represents a form of spiritual anorexia. We’re spiritually dehydrated and our soul needs attention. In some sense, we recognize that “emptiness”, which is where the big, round belly comes in. Rather than acknowledging our need for soul food, we try to fill that void with material objects or through outside sources. We’re meant to be looking inward, but our focus is outward as we try to gorge ourselves to correct the hunger. However, that cap at the top of the five is our “higher self”, our search for knowledge, our desire for a spiritual connection. So, in short, the five means that we should honor our Spirit’s need for soul food and stop trying to fill the void with outside influences or material objects. This card also features pentacles, which indicate one of two things (or both). First, they represent money… when not referred to as pentacles, these symbols are called, quite appropriately, “coins”. In some cases drawing pentacles could indicate an in-flow of funds, money coming to you. However, this card triggers a different feeling. In this card, it’s likely loss of funds or stress over money that is causing that spiritual void. In other words, we can be so focused on what we need, what we don’t have, or what we’re responsible for, that we drain our soul’s needs trying to meet the physical demands of the reality in which we live. On the picture in this card, we see two individuals… poverty stricken, wounded, weary, and looking haggard and lost. This is the “poor me” syndrome. Rember the stories Grandma used to tell about having to walk to school… ten miles…. in the snow…. with no shoes…. uphill…. having skipped breakfast? It’s like a contest to see who can be the most miserable, or who has things the hardest. It’s victim mentality at its prime. 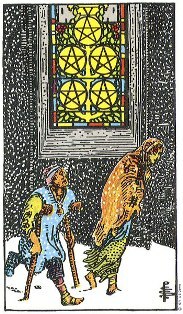 However, in the background of the image is a stained glass window, which is where the pentacles are featured. This indicates a divine opportunity, a spiritual window, the wealth we “crave”, and yet the people in the picture are so focused on their own poor status that they’re oblivious to the opportunities that are right within reach! The moral of the card, in short? Stop focusing on your losses or what you don’t have, or what you need – and start honoring your spiritual needs. Have faith moreover than self-pity. Well, that’s my interpretation of it, anyway. Let’s see what a few other sources say just for good measure. “The two figures on the Five of Pentacles are cold, hungry, tired, sick and poor. They show us what it feels like to be without – to lack the basic ingredients of life. This is the specter that haunts so many in our world – a reality that is all too immediate. Those of us who are more fortunate may not have experienced this extreme, but we still recognize suffering. When we do not have what we want and need, it hurts. In readings, the Five of Pentacles can represent several kinds of lack. First, there is poor health. It is hard to tackle life’s challenges when we do not have our vitality and strength. This card can be a signal that you are neglecting the needs of your body. You are moving away from complete physical well-being, so you must take steps to discover and correct the problem. Of the questions asked of the Hierophant by a troubled supplicant, the problem is real world. The answer, however, appropriate to the Hierophant, is usually spiritual or at least pragmatic. Understand that all Fives temper the Querent – you go through the fire, the low points, the hard times, in order to come out stronger. NOTE TO SELF: When doing readings in the future and this card survaces, do not neglect the issues related to health, cations to guard health, or warnings of illness. My concept of disease is that it should be a hyphenated word, dis-ease. Ill-health us usually related, in my opinion, to a spiritual imbalance. Once the spirit is fully nurtured, the body follows. The rest of my definition seemed on target, but the health factor was lacking. As a mental reminder, look at the CRUTCH in the card… we don’t just see poverty, but also a need for medical attention.